Traits of Horus people: Impatience, Endurance, Wit. Lucky Colors: Carmine Red for Men, Gold for Women. Associated Zodiac Sign: Libra ♎. Horus - Egyptian god of Love, Stars, Heaven, the messenger of the gods and the protector of the pharaohs. He is portrayed with the head of a falcon or just in the form of a falcon with a sun disc over his head. According to legend, his eyes see at night as well as during the day. The children of Horus are of an easy nature, they are simply created for flight, for example, for flight of thought. They have a rich imagination, fit any creative profession. They are endowed with a special gift to understand animals, so they are the best zoologists and trainers. When tamed, they use not so much force as caress, and the beasts joyfully submit to their commands. Friends appreciate these people for their cheerfulness and optimism, as well as for their generosity and cheerful, easy temper. At the same time they are quite pragmatic, they know how to set goals and achieve them. They do not avoid responsibility, although they are always ready to take risks. We are sure that fate will be favorable to them, and this fully corresponds to reality. We can say that these people lack patience and diplomacy. They are contraindicated boring and uninteresting work or a boring partner. In general, the children of Horus are very amorous, especially in their youth. Their love is fleeting, but over the years their feelings become deeper, and they themselves are more permanent. 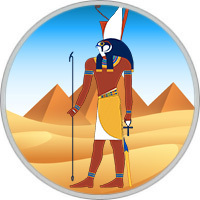 Men born in the days that Horus patronizes are people who are endowed with special traits of character: strong-willed, self-confident, with a lot of stubbornness. Selfless. They do everything possible for those they love, who need their help and protection. Industriousness, practicality and some conservatism. Mind and honesty are a high responsibility for their actions. All representatives of the god of heaven, sun and height, have high intellectual abilities, They can become politicians, psychologists, scientists. Women under the protection of Horus are very strong natures, hard-working, take care of all the care of the house, children, relatives and friends. Horus women are patient listeners. They are able not only to listen, but also to help all that seems possible to them. They get along well and get along with other people. They love the comfort and cleanliness of the house, follow their habits, are distinguished by their conservatism and some despotism. Women under the auspices of the god of love worship their chosen ones, their families and children. They are extraordinary cheerful and able to inspire others to beautiful deeds and deeds.